A group of European physicists, the PLUME collaboration, aims to prototype an ultra-light device intended to equip one of the thinnest and lightest elements at the inner heart of the ILC detectors: the vertex detector. At CERN one month ago, a full-scale prototype equipped with CMOS pixel sensors was successfully tested in beam. A new version of linear collider data storage software was released this past autumn to accommodate detector scientists' increasing sophistication in simulating particle events. LCIO (the name comes from 'linear collider input/output') continues to facilitate agreement among the world's linear collider groups with a common event data model and file format for data exchange. The International Committee for Future Accelerators (ICFA) sponsors a meeting every three years on “Future Perspectives in High Energy Physics.” This year the ICFA seminar was held at CERN and it broadly covered plans and ideas for future facilities for our field. This meeting was particularly timely, as it coincided both with the completion of the impressive first year of running of the LHC and with the kickoff of the update of the European Strategy for Particle Physics to be completed in 2013. 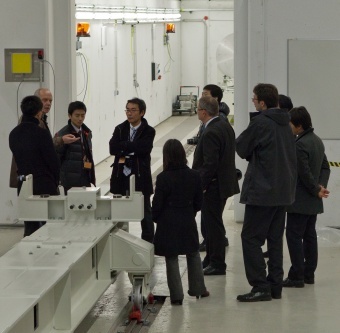 A delegation from the prefectures Fukuoka and Saga on the Japanese island Kyushu visited two European labs, CERN and DESY, last week to learn about existing research infrastructures and the labs' experiences with management, administration, local communication and a whole lot more. The region is one of two possible Japanese sites for the ILC, and the delegation, consisting of four members of the Fukuoka/Saga ILC planning committee, wanted to establish a dialogue with the European labs to exchange ideas and information. At DESY, they heard about DESY regional cooperation, socioeconomic impacts, innovation and technology transfer, outreach with local communities and of course DESY and the ILC. They also visited some facilities on campus, including the new accelerator module test hall for the European X-Ray Free-Electron laser XFEL, pictured here. Superconducting radio frequency (SRF) advances at Fermilab depend not only on the melting pot of Fermilab employees old and new, but also fundamentally on both national and international collaborators. After this year’s very successful run of the Large Hadron Collider (LHC), the world’s most powerful particle accelerator, a sense of great excitement is beginning to pervade the high-energy particle physics community. The search for the Higgs particle… or particles… or whatever appears in its place… has entered a crucial stage. Researchers in Japan have developed what may be the first string-theory model with a natural mechanism for explaining why our universe would seem to exist in three spatial dimensions if it actually has six more. Is the Higgs boson real? The Fundamental Physics at the Intensity Frontier Workshop was set up to survey existing research and future scientific possibilities in this area, and to gauge the level of interest from the physics community.